Empaths just know stuff without being told. It is a knowing that far exceeds intuition. The more ‘aware’ they become the stronger this gift grows. Being in public places can be overwhelming. Where ever there are lots of people, it can fill an Empath with turbulent emotions. Feeling others emotions and absorbing those feelings like a sponge is a huge one for an Empath. Some will feel emotions of those near by and from those at a vast distance. The more adept Empath will know if someone is having a bad day, even from another part of town, city or country. TV is unbearable. Trust is a big one. An Empath knows when someone is not being honest. You can’t tell an Empath lies and get away with it. If someone is saying one thing but feeling another, you know. An Empath can pick up physical symptoms off another person. Developing ailments such as a cold, eye infections or aches and pains especially from those close to you is not uncommon. Empaths often get drained of their energy, either from the energy of other people (energy vampires) or because they just take on too much from others, sleep often doesn’t help. 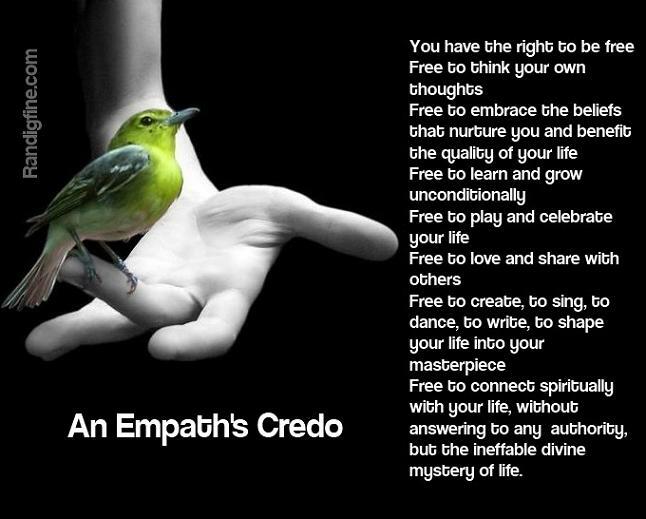 Empaths are drawn to healing, holistic therapies and all things metaphysical. Anything of a supernatural nature is of interest to Empaths and they don’t get surprised or shocked easily. Sensitives are very creative, and will have a strong creative streak and a vivid imagination. They love and adore nature and animals. They have an incredible strong need for solitude. Empaths get bored and distracted very easily, work, school and life in general must be kept interesting. A Sensitive will always be striving for the ‘Truth’. Anything untruthful feels painful. Routine, rules, control or anything that takes away their freedom is debilitating and poisoning. An Empath is an excellent listener, they won’t talk about themselves much unless it is to someone they really trust. They love to learn and understand about other people because they genuinely care. Empaths can sometimes appear moody, shy, aloof or disconnected, they can not hide behind there facial expression. They detest having to pretend at anything. Empaths are unique individuals with many special gifts, they are here to help raise the vibrational energy of the World. If you know an Empath, or if you have the pleasure of meeting one, please treat them with the respect they deserve, they are not freaks, they are simply beautiful human beings with a sensitive and incredible Soul.